The Royal Air Forces Association is helping serving personnel feel more connected to home by launching the ‘Wings Doodle Box’. The boxes will be given to all children who receive a Storybook Wings story from now until the end of 2018 and are being launched to coincide with the tenth anniversary of the hugely popular scheme. The boxes contain a pillow case, wash bag, welcome home banner and cards, all of which can be coloured in using the fabric pens provided. The box itself can also be coloured in to make it stand out in a parent or carer’s bedroom. Shameera Mandhu, who manages the Storybook Wings service at the Association, said: “Storybook Wings remains a hugely popular way for children to feel connected to a parent or carer who is working away from home. 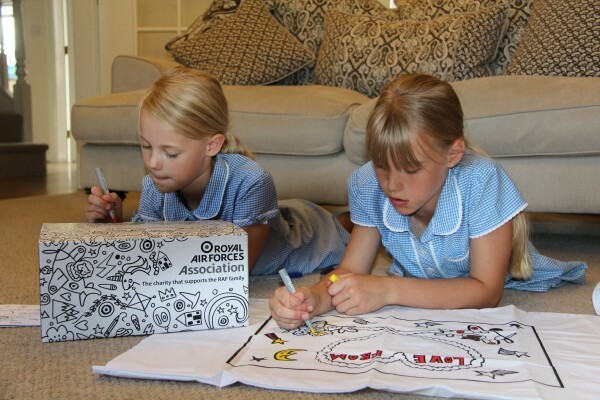 Developed in conjunction with Meg Wickett from the HIVE (community hub) at RAF Benson, the Wings Doodle Boxes will allow parents to take little personal touches from home away with them, something to make them smile and feel a little closer to home and family.